The death of military pilot during U.S. Air Force trials of a small combat plane considered key to the Afghanistan War is not expected to hamper the project or deter the service from future experiments with different types of weapons before buying them, a top general said Tuesday. Senior Air Force officials are still planning to solicit bids for a new light-attack propellor plane from Textron’s Beechcraft and a Sierra Nevada Corp.-Embraer team as soon as December, Lt. Gen Arnold Bunch, the Air Force military deputy for acquisition, said Tuesday during a briefing at the Pentagon. In the meantime, the Air Force has canceled flying portions of its experiment of the two planes following last month’s crash of an Embraer A-29 Super Tucano. The tests were supposed to continue throughout July. Instead, the Air Force will continue the tests using a “surrogate aircraft” in their place, Bunch said. Nonetheless, the crash is a setback for the effort, which now has the support from the military and Congress since initially being championed by a small group of Air Force officers more than a decade ago. 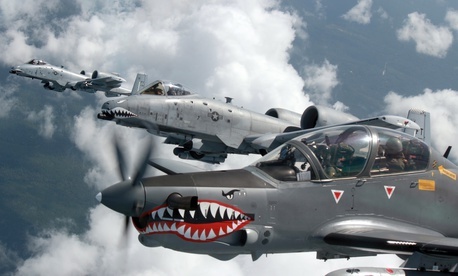 The Air Force began flight trials of the Super Tucano and Beechcraft’s AT-6 last year. The goal is to use the planes to support ground troops in areas like Iraq and Afghanistan where there is little threat of being shot down by enemy fire. The single-engine turboprops are much cheaper to fly than gas-guzzling jet fighters. Like most high-performance fighters, the light-attack planes can carry smart bombs and have intelligence sensors and camera. This year, the Air Force continued its trials of the two planes, focusing on logistics, maintenance and network connectivity. The Air Force wants to create an international computer network that allows pilots in different types of planes, from different countries, to be able to share information. While pilots can talk to one another on a radio, planes made by different companies are oftentimes unable to share targeting and other intelligence data electronically. “We had been asked to come up with a network that would be 100 percent exportable that we would be able to install in the aircraft,” Bunch said. More than 50 countries were invited to observe the experiment later this month. For now, that “distinguished visitor” event been postponed since the flying has been canceled. The presentations were expected to focus more on the network being tested than the aircraft themselves. Buying the planes themselves “might be the easiest part” of the project, the general said. Having pilots, maintenance workers and contracts in place is a different story. The Air Force still could solicit bids as soon as December, Bunch said. “If we decide we are going to go forward with the acquisition … that’s the challenge that’s been given to the acquisition community — that’s where we’re marching to,” he said. The AT-6 and the Super Tucano are the only two planes expected to be considered in the competition. “At this point right now, I’m seeing it as a competition between two airplanes,” Bunch said. If the Air Force moves ahead with the program, it wants to choose a winner by the end of fiscal year 2019. Congress has added money for the effort in that year’s budget. But since it has halted flying both planes, the Air Force will collect additional maintenance data from the companies that make the planes. “The Air Force decided to conclude the flying portion of the Light Attack Experiment. We will work with our industry partners to complete any remaining test requirements (developmental, maintenance and/or sustainment data) that are necessary to support future acquisition decisions,” Bunch said. Navy Lt. Chris Short was killed on June 22 when his Super Tucano crashed in the New Mexico desert. The Air Force will not say what caused the crash until safety and accident investigations are complete. Navy and Marine Corps pilots and weapons officers are helping the Air Force with the experiment.